Do all humans beings, also those on the farthest edges of the globe, share the same emotional spectrum including: anger, shame, happiness, excitement, disappointment and joy? If so why do people across cultures manifest their feelings and thoughts in such different ways? Why can two people sharing a conversation be left with contrasting feelings: shame versus excitement? More so not understanding why the other side feels to differently than them? As an Israeli and German met for the first time shortly after shaking ands, the topic of family history came up illustrated by a statement: “My family had lived in Germany for 300 years, until..” said the Israeli while the German’s automatic feeling visibly throbbing was being ashamed and uncomfortable. The Israeli thought this introductory step was an invitation chat as the German thought this statement out of place and embarrassing. The last action the German would take now is a step closer feeling comfortable and ready to go to business with this Israeli. Cross-Cultural interactions trigger emotions, accompanied firstly by automatic thoughts and later by actions. Despite the fact both people were glad to meet, the pleasant hand shaking rapidly became complex Cross-Cultural emotional turmoil. Silvan Tomkins, human feelings researcher, conclusions that all humans have the same range of feelings embedded in basic human physiology and biology. Therefore he claims, all humans share the exact same feelings worldwide. The difference is in the When the Why and How. When will an individual feel curious for example, Why is curiosity the automatic reaction to a specific situation and How is the curiosity expressed. Shame steps in now. Shame is a pivotal feeling, Tomkins states. It is this one feeling that is a social feeling projecting on an individual. Shame is the change, the turning point between positive feelings to negative feelings. Dancing a close intellectual tango with Tomkins’ ideas, Donald Nathanson creates the Compass of Shame. This Compass Of Shame sheds light on the personal and collective outcomes shame may leads to. Shame leads to Withdrawal, Self Attack, Avoidance or Attack of Other. None of these four possibilities are effective in Cross-Cultural encounters and can only intensify the murk arising from Cross-Cultural misunderstandings and cultural gaps. Had the Israeli detected to the uncomfortable feelings of the German such as the change in body language, taking a step back and seeming less enthusiastic to collaborate the result could have been different. Had the German shared or reflected the automatic feelings revealed, there could have been a chance to mediate this Cross-Cultural threshold. Shame is definitely a feeling you would want to avoid creating with stake holders in international negotiations, encounters and business. 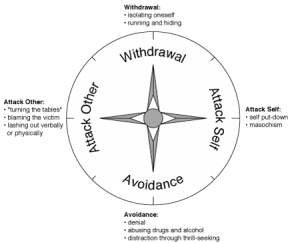 Check the next post dealing with The Compass of Compassion for navigating most effectively across cultures. Acknowledging cultural taboos, sensitive topics and collective memory emotional levers leading to shame in a specific culture are of high importance. Only being aware of this will enhance your likeliness to mediate Cross-Cultural gaps rather slip into cultural thresholds.